Like most Americans, I had never been to a tea ceremony before I visited Green Gulch Farm Zen Center for a Sunday tea gathering. 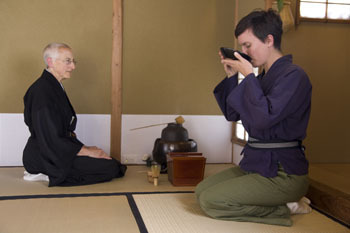 Truth be told, I really had no idea what a tea ceremony was or how it was related to Zen, which made it all the more mysterious and alluring when I discovered it on the Zen Center�s calendar. 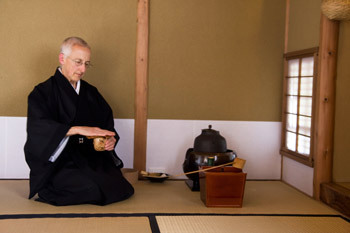 Meiya Wender, Zen priest and chado instructor, is quick to correct me repeatedly when I ask questions about this mysterious tea experience. She says that there is no ritual, no religious tradition about it, so therefore it cannot be called a ceremony. After partaking in the experience myself, I would have to agree. That day, I had arrived a few minutes before it was set to begin, along with eight or so other visitors. Meiya, along with tea student Lauren Dito, met with everyone in front of the teahouse gate. I had no idea, but �the Way of Tea� had already begun. We were instructed to walk carefully, single file, along a path of rocks once we entered the gate. 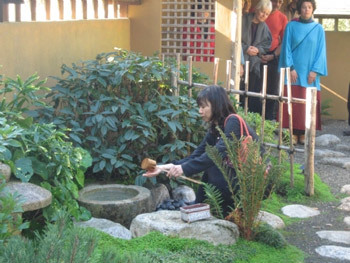 Eventually we would come to a bench where we could set our things down and wait as each person individually walked up to a fountain to wash their hands on their way to the teahouse. We were also told to use the water ladle with care, making sure to set it down where we had found it. As the soft-spoken, casual banter began to die down and it was nearly my turn to wash my hands, I began to notice who had not set the ladle back where it was, and who had. The quiet, gentle practice of washing my hands became more than the mere act itself. Meiya�s instructions haunted me, and I believed I had set the ladle down correctly, although I wasn�t sure�was I focused enough? Was I really present? �In the tea room, what happens in your mind gets exposed in physical movement,� Meiya later explained. Our next step was to take our shoes off as we kneeled on the rattan mats, making sure to keep them outside of the teahouse. Once inside, Meiya explained that we were to admire the flowers gathered on display, as well as the calligraphy on the wall, both reflective of the summer season. Meiya was helpful to note that the flowers were not meant to be �arranged,� but rather �gathered� as they were found growing wild outside. As my group settled in and took our places, sitting on our knees facing each other, we were given sweets and, eventually, the vibrant green matcha tea. We were instructed to carefully study every item presented before us. And after the tea had been whisked in a small black pot by Meiya, and gently handed to me by Lauren, I realized that the tea was a small feature of a larger experience. The scent of the incense, the sound of the kettle, the striking image of the calligraphy and flowers, and the feel of the warm bowl of tea all left a rich impression that stayed with me beyond the few hours I spent enjoying them at Green Gulch. A variety of chado experiences are offered at Green Gulch, including monthly public tea gatherings (such as the one described above), private tea gatherings, classes and seminars. See our website for more about these Way of Tea offerings, as well as the Sowing the Moon Teahouse blog.